By Todd Abelson NMLS #180858 on December 18, 2013 . In times of need over the last few years, consumers have turned to payday loans, an extremely accessible source for cash in the form of an advance against their paychecks. Unfortunately, what is helpful in concept, has been deemed predatory due to high fees and has been outlawed by at least 12 states in the US. Payday loans can be issued by financial establishments including banks and those that cash checks, and require a minimal background check. It’s this accessibility that has landed many consumers in the endless cycle of payday loan borrowing, though. The problem that arises from payday loans is the associated fee. A payday loan is a loan, so interest is charged, but instead of it being a percentage of the amount, a flat dollar amount is charged. That fee has been known to be as high as 390% based on annual percentage rate. The fees accrue quickly if the loan is not paid back within the allotted time of anywhere between 2 weeks to 35 days. Emergencies happen and payday loans have been there for consumers in times of need, but if someone falls into a cash hole, this financial instrument makes it extremely difficult to get back to even. If a borrower does not have the cash they need now, there is little chance that that they will have it after paying back the loan with fees. For consumers that fall into this category, it’s time to start planning for a better financial “plan B” now, starting first by creating a budget of income vs expenses. Then, they should get to know their credit score. Depending on credit history, a personal line of credit may be an option. Visit your bank to find out what other options may be available. If other forms of credit cannot be granted, then it’s time to tighten the belt and start to contribute to a savings account. Payday loans are never a good idea. Consumers that borrow against their paychecks, will typically find themselves in a deeper hole and an endless cycle of borrowing, so check out your other options today. Need guidance while navigating the complicated world of mortgages and real estate? Look no further than Todd Ableson of Tucson Mortgages, the experts on Tucson Mortgage Rates. Everyone who works with Dawn comes away with the same impression – She’s awesome! Now, she’s licensed! Having passed all Federal & State exams, she’s “blessed” by the regulator-gods. Mortgage guidelines to tighten FURTHER! By Todd Abelson NMLS #180858 on December 3, 2009 . Just when you though it might be getting easier to qualify for a home loan, Fannie Mae and Freddie Mac (aka “The Grinchs”) are implementing TIGHTER qualifying guidelines for their loans. “An updated to the maximum allowable total expense (debt-to-income) ratio to 45%, with flexibilities up to 50% for certain loan case files with strong compensating factors” (accents placed above be me!). Maybe this is a good thing, that of limiting DTI ratios to 45%, but I estimate this may choke off approx 20% of currently prospective home buyers (from here-on forth they shall be called “wanna-bes”). At best, the timing of this change is horrible since the “first time home-buyer” and “move-up home-buyer” credit programs have been extended through 6/30/2010 (with contracts ratified by 4/30/2010). Talk about the left hand not knowing what the right hand is doing??? Santa’s putting a lump of coal in their stockings for sure! By Todd Abelson NMLS #180858 on February 11, 2009 . It’s important to note that raising your credit scores is a bit like losing weight: It takes time and there is no quick fix. In fact, quick-fix efforts can backfire. The best advice is to manage credit responsibly over time. 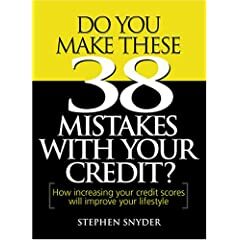 There is a must read Do You Make These 38 Mistakes with Your Credit? How increasing your credit scores will improve your lifestyle . This book is one of the better reads about improving your credit scores. Realtors® Do You Make These 38 Mistakes with Your Credit? How increasing your credit scores will improve your lifestyle is a great book to give your clients. To see how much your scores will increase click here. The longer you pay your bills on time, the better your score. If you are having trouble making ends meet, contact your creditors and set up payment plans. This won’t improve your score immediately, but if you can begin to manage your credit and pay on time, your score will get better over time. By Todd Abelson NMLS #180858 on June 16, 2008 . When you read the newspaper, listen to the news on TV, have a discussion with friends, family and colleagues it becomes clear there are many factors influencing our economy. You hear concerns about the price of gas, slow economy, housing market, interest rates, inflation and 2008 Presidential election. There is one thing for certain, we have little or no control over change and change is inevitable. So why not make the best of change? Educate yourself and prepare for the ups and downs of the market and take advantage of opportunity. There are many good books on the subject of money and finances. I am a big reader and am always looking for ways to improve my situation and grow as a person. For those of you that like to read and educate yourself a great book on the subject of finance is Rich Dad Poor Day by Robert Kiyosaki. I am a contrarian. In finance, a contrarian is one who attempts to profit by investing in a manner that differs from the conventional wisdom, when the consensus opinion appears to be wrong. Now is a good time to buy and take advantage of some great deals that are available that won’t last forever!!! There has been some positive data in the Tucson’s housing market put out by the Tucson Association of Realtors® Multiple Listing Service, Inc (MLS). If you would like a copy of the full residential sales report put out by the MLS give me a call and I will email it to you. It is worth looking at. Below are some highlights of the report. Home Sale Units Increased 8.1%. In April there were 973 homes sold. This is good news for the Tucson housing market. Inventory levels are staring to come down. It is all about supply and demand and getting the inventory levels back to an equilibrium which is slowly starting to happen. “Live Frugally” while being grateful for life. Live within your means and save money. “Stay Liquid” Have cash available to prevent the need for credit and to take advantage of opportunity when it presents itself. “Buy Income Producing Assets” put your money to work for you rather than having to work for money. Make it a great day! You deserve it!